Fluoride Toothpaste helps to reduce causes of plaque and bad breath. Shipping Fee : Free Free Shipping for order above RM500 / (exclude Maqui Plus+ and Roxburghii Plus+). 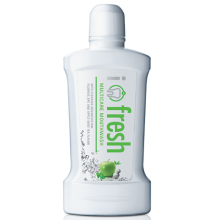 i-fresh Multicare Fluoride Toothpaste with patented Japanese technology ""Aquanized Ion"" - negative ion water can effectively penetrate to clean food residue and bacteria from hard to reach areas between teeth which cause plaque and bad breath. Contains unique ingredients proven to be good for teeth and oral health. Hydrated Silica - With particles smaller than 10 microns, this tooth abrasive agent can penetrate deep without damaging dentin and enamel. Apple-Zn-F extract - Protects against plaque build-up resulting from accumulation of bacteria. The energizing raw apple and Zinc mineral extract has been found to be 20 times more effective than green tea in stopping plaque-producing bacteria. While Fluoride helps prevent cavities. Apple Mint Tea Flavor - Unique energizing flavor of Apple Tea, coupled with the refreshing cool sensation of Mint, provides a delightful feeling every time you brush your teeth. Eliminates plaque, bacteria, and bad breath. 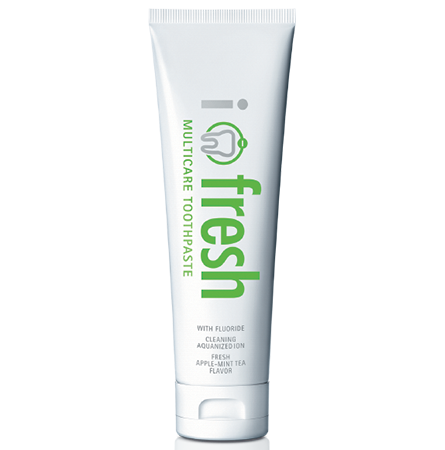 Brush your teeth with i-fresh Multicare Toothpaste at least twice a day and after meals.